Taiwan experienced one of the worst train accidents in recent history on Oct. 21, 2018, when a Puyuma Express train came off the tracks near Su’ao, Yilan County, in Taiwan’s northeast, killing 18 and injuring at least 200 more. An investigation into the possible causes of the crash — including operator error, administrative incompetence, and technical flaws — is ongoing, although partial blame has already been assigned to a critical design flaw in the safety system of the train. Puyuma Express train number 6432, carrying 366 passengers with service down the eastern coast of Taiwan from Shulin, New Taipei City, to Taitung City in Taiwan’s southeast, derailed at 4:50 PM on a curve near Sinma Station in Yilan County — roughly 43 miles (70 kilometers) southeast of Taipei City. All eight passenger cars jumped the rails, with five overturning completely. Emergency services were dispatched from Yilan County, New Taipei City, and Keelung City while the central government deployed 120 military personnel to assist emergency operations at the scene of the derailment. While initial fatality counts reported 22 dead, the Taiwan Railways Administration (TRA) revised the final count to 18 dead by 10:45 PM. TRA Director-General Jason Lu Chieh-shen announced the formation of an emergency task force to coordinate response efforts and lay the groundwork for a full investigation of the incident and noted that the vast majority of fatalities were in the first car. Additionally, a 43-year-old American woman was among the scores injured. The derailment is Taiwan’s most disastrous rail accident in almost three decades. The Puyuma Express service is one of the fastest trains on the island, being a tilting train service commissioned relatively recently in 2013 to alleviate traffic congestion on the limited roads in the rugged terrain of Taiwan’s eastern coast, and was described by mechanics as being well-maintained. A government task force commissioned by Taiwan’s Premier Lai Ching-te attributed the massive derailment to excessive speed, with train conductor Yu Chen-chung being held on suspicion of negligence after he was found to have disabled the train’s automatic protection system prior to it entering the fatal curve at over 87 miles per hour (140 kilometers per hour) — more than double the speed limit for the curve. Yu was ultimately released on bail on 500,000 New Taiwan Dollars (about 16,140 USD) bond. The situation, however, was not as clean-cut as the initial findings of the commission appeared to suggest. In initial hearings in Yilan District Court on Oct. 23, Yu blamed himself entirely for the derailment, stated that he would not mount a defense, and waived his right to legal counsel. While the TRA claimed that Yu had disabled the automatic train protection system without the knowledge or approval of the control center responsible for the section of track, testimony in court by Yu — corroborated by a full 43-minute recording of communications between Yu and the control center — stated that Yu had in fact informed and received approval from TRA dispatchers to disable the train’s automatic protection system. Further information presented in court hearings found that Yu was not a regular operator of high-speed Puyuma Express trains but only a part-time operator who ended up driving the train due to a lack of regular weekend operators. No depot staff boarded the train to assist Yu, in contravention of TRA standard operating procedure. Additionally, Yu had been encountering technical difficulties on the express train all the way to the final moments before the crash and had requested to stop the train for repairs. However, TRA dispatches rebuffed his request and mandated that he make up for time lost to delays. Amid growing criticism of perceived wider cultural issues at the TRA and public anger over the contradictory statements made by the TRA on Yu and the derailment, Transportation Minister Wu Hong-mo accepted the resignation of TRA Director-General Lu on Oct. 25 after initially rejecting Lu’s offer to resign in order to urgently investigate the causes of the derailment and properly deal with the aftermath of the disaster. 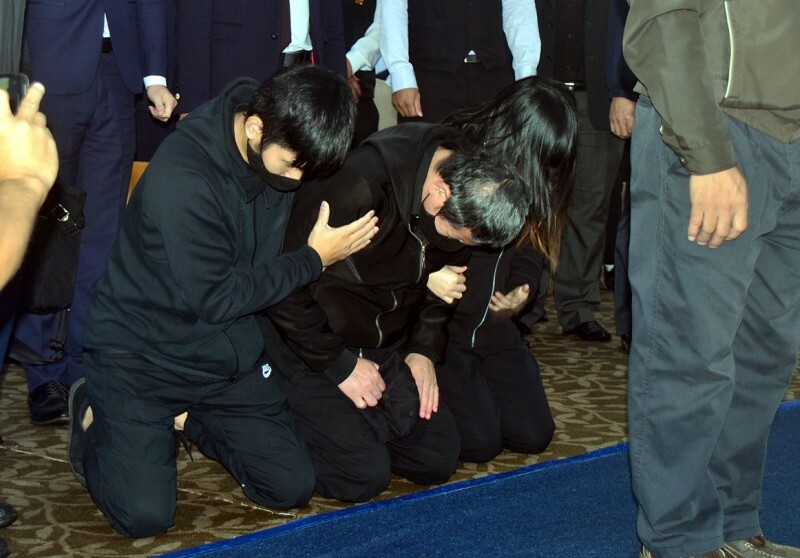 At a memorial service for those killed in the derailment held in Taitung City on Oct. 31, Yu Chen-chung wept and begged for the forgiveness of the families of the victims. He described the incident as “a pain that will dwell in my heart forever” while repeatedly kowtowing his forehead into the ground before being pulled to his feet by relatives of the victims of the crash. On Nov. 1, officials at Nippon Sharyo, the Japanese manufacturer of the derailed train, announced that a preliminary investigation conducted by the company had found a fundamental design flaw that might have contributed to the crash. The investigation found that while the automatic train protection system — which automatically applies brakes when the train exceeds the programmed speed limit — was not affected, the fault, which lied in the wiring between the system and the control station, made it so that the control station was not alerted when the protection system was turned off. Shares in Nippon Sharyo dropped by 17 percent during trading in Tokyo on the same day. Nippon Sharyo has announced a fix to the flaw and has already begun testing the fix. Once successful, Taipei and the TRA will have to negotiate with Nippon Sharyo to determine the amount of time needed to install the fix on all 18 Puyuma Express trains. Additionally, while Puyuma Express service has been restored, observers suggest that reconstruction efforts in Hualien — which lies due south of Yilan on the rail line and has been roiled by several sizable earthquakes this year — may be complicated by the disruption caused by the derailment.